Situated north of Playa Santa Teresa and south of Manzanillo lies Playa Hermosa. Aptly named, this exquisite stretch of beach has some of the most stunning beaches in the world. 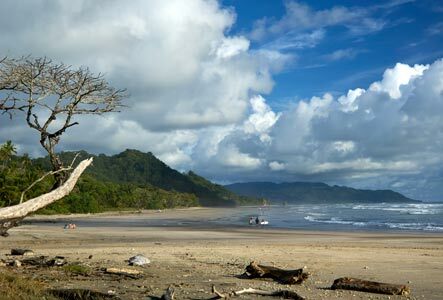 Playa Hermosa means “Beautiful Beach” and there is little wonder why. Sublimely curling waves break upon secluded white sand beaches. Behind the palm-studded beach and narrow swath of forest, there is a relatively flat area, which has quickly developed over the past 10 years with luxurious residential estates and small boutique hotels. Many fashion shoots have taken place on Playa Hermosa as the fashion industry has begun to discover the bewitching beauty and wonders of Playa Hermosa. 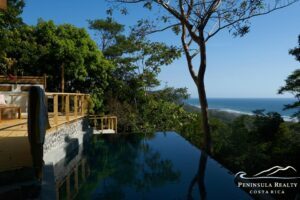 With such uniquely alluring topography, Playa Hermosa real estate has appreciated significantly in recent years. Some of Costa Rica’s most renowned hotels are found in this area. International celebrities and the jet set have honed in on the area with almost daily sightings of celebrities and multi-million dollar purchases occurring regularly. With beachfront land often unavailable, development has moved up to the slopes behind the beach and farther inland to Santiago. Several properties boast magnificent Pacific Ocean views. For families with children, Hermosa Valley School, located right behind Playa Hermosa proper, is an immediate draw. Following the coastline north of Playa Hermosa, there is a lovely tract of beachfront forest that is protected through the zoning plan from any future development. No building permits will be issued in this zone and this natural bounty provides a wonderful buffer against overdevelopment. Rising steeply, the forest culminates in the peaceful hamlet of Manzanillo. 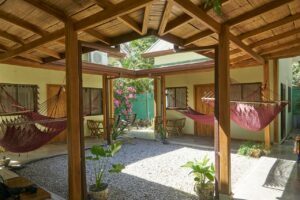 South of Playa Hermosa is the commercial town of Santa Teresa with its bustling surf community, supermarkets, restaurants, services and activities.